Fun retro style postcards make it easy to let friends and family know that the two of you are ready to make it official. We've collected some amazing designs for you to choose from including cute retro style destination wedding illustrations, old-fashioned pictures, and vintage style lettering that will appear over your gorgeous couple photos. Postcards make it easy to inform your would-be guests to save your special date. All of our amazing designs are printed on high-quality card stock and have been created by individual artists who keep shop at Zazzle, a world leader in custom and personalized print-on-demand stationery, apparel, and other fun gift items. You can order as many, or as few, postcards as you need. They're easy to personalize with all of your important information and in some cases, your cute couple photos. Save time and money using postcards instead. There's no extra envelopes to address and the postage costs less too! Not to mention, they're the perfect accompaniment to a vintage or retro theme wedding. Fun save the date postcards that feature retro travel poster illustrations of popular wedding destinations. We've only got room for a few of these marvelous save the date destinations but there's plenty more to see. Fun illustrations and vintage style typography give these save the date postcards a rustic retro look and feel. 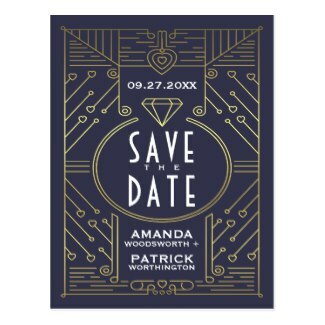 We've selected cute vintage-look save the dates that mimic library cards and telegrams as well as classic wood, floral designs and whimsical mid-century designs. Upload your cutest couples photo to one of these Save the Date postcard templates to create a gorgeous reminder for friends and family that your most romantic day is on its way. Templates make it easy for you to add a photo and personalize your announcements with your names and special date. ​There are many, many, MANY more amazing retro and vintage style designs to see!